I never intended to start a photography business. Like many people, I became interested in photography and the business just sort of fell into my lap. While we’ve come a long way since then and I was able to leave my day job to do photography full-time, I made several mistakes when starting out that I wish I could go back and do differently. These mistakes are easy to avoid if you are aware of them, yet it seems like almost all new photographers make them. 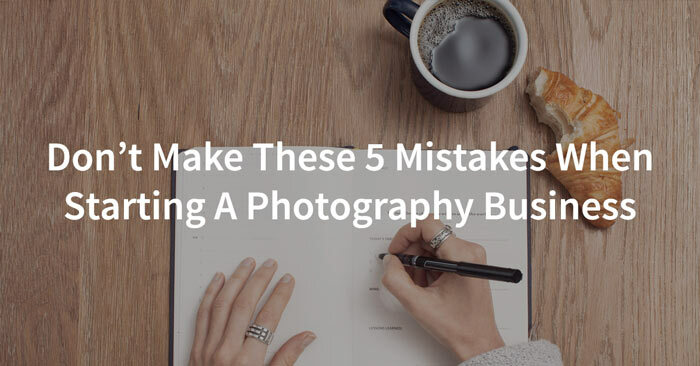 Here’s 5 common mistakes to avoid when starting a photography business. Skipping this step will seriously hurt the future of your business. If you don’t know how much you’ll need to charge to make your desired amount of profit after taxes and expenses, you’ll end up having to raise your prices significantly your first few years and will lose clients in the process. This free photographer’s pricing guide can help you figure out what you need to be charging to make the profit you desire. This number may seem a lot higher than you think people will pay, but knowing this number is vital to helping retain as many clients as possible from the start of your business. Plus it gives you an accurate idea of what it takes to actually run a business and be profitable. Now that you know what you’ll need to charge to sustain your business, create a pricing list with these prices so that the clients you’re working with now will know what to expect in the future. This sets an appropriate anchor point in their mind. An anchor point is a stated point of reference to which they will compare all your prices in the future. An anchor point affects how much they think your work is worth. So if you originally start by charging $50 but they don’t know how much you plan on charging in the future, they will think you’re too expensive once you’re charging $350 because you’ve made $50 the anchor point in their mind. If you have your prices set at $350 to begin with, the $50 portfolio building special price will seem like a great deal and they’ll know what to expect when they come back next year for portraits. By shooting for free, people do not value your time or your work nearly as much as if they are spending money, regardless of the amount. Instead of giving them both the session and disc of images for free, offer to give a free portrait session with the option to buy prints or the digital images at a discount from your normal prices. Determine how long you are going to offer this. For example, you may offer your deal to anyone who books a session with you within the next month but allow them to schedule over the next 6 months. This is a great way to get your business off the ground and have several months of sessions on the calendar from the start. Make sure they know what your prices are up-front so there are no surprises. Show them both your full prices as well as the discounted prices you are offering to set expectations correctly. People will value your work more if they have to pay for it. If they value it, they’ll put more effort into preparing for the session and be less likely to reschedule or cancel. They’ll take your business more seriously since it won’t just be viewed as a hobby that you can do for free. There’s no risk for the client with this kind of photography offer. If they don’t like the images, they don’t have to buy anything. But if they do like the images and buy something, you’ve made some money. Either way, you’re still getting images for your portfolio. I don’t even want to think about how much money I lost the first few years of my business by not doing in-person portrait sales. My portrait sales average more than tripled when I went from an online gallery to in-person sales. You don’t need to have an expensive projector or even a laptop. My initial investment was about $15 for black foam core and about $25 per session in proofing costs. It sounds scary, but the images sell themselves. You’re just there to help them decide between which photos look best and what size they need for an image. It will also show you what images people really love and what they aren’t as excited about. While this may be a scary proposition when you are first starting out, it’s a great thing to learn so that you can improve faster. I believe that starting an email marketing campaign is the number one secret weapon that will help you to grow your portrait business faster than anything else. Yet many photographers never take advantage of this incredibly valuable marketing tool. I’m not talking about a list that you keep in your email account, nor am I talking about buying emails from some service and emailing people who know nothing about your business. Instead, this should be a list that you use a service such as Aweber or Mail Chimp. This is a list that people can sign up for on your website that educates your customers and tells them when you have a special offer from them. The beauty of using one of these email services is that you can create a series of messages that are sent automatically to people who sign up for your mailing list that educate them about something they really care about. I’ll be talking more about the specifics of using this to make lots of extra profit in the next few months, so sign up for my newsletter in the sidebar above to hear more about it. On the most basic level, you could explain how to dress for their session, things to avoid doing before a session, what products are best for showing off their images, really anything that they’ll want to know that will make them feel empowered. They’ll receive these automatically without you having to do anything, and you can schedule them to be sent at specific intervals after signing up for the list. Similarly, when you send out an email announcing a special promotion, such as a day of mini-sessions, you are more likely to book them because they are always devoted to your business and like your work. They want to hear about these offers so that they can take advantage of them. They wouldn’t have given you their email address otherwise. What are some mistakes you’ve made? These are 5 of the mistakes I made when starting my portrait business that I wish I could go back and do over. What advice would you give to someone who is just starting their own photography business? Leave a comment below and let us know! If you liked this article, sign up to get photography business tips sent right to your inbox.